(Nanowerk News) A Milwaukee startup company founded by an engineer at the University of Wisconsin–Milwaukee (UWM) has completed a licensing agreement with the UWM Research Foundation for intellectual property that the company will use to develop nanoscale products and devices. NanoAffix Science LLC, founded by Junhong Chen, UWM associate professor of mechanical engineering, aims to commercialize technologies Chen has developed. Those include novel techniques for creating custom nanoparticles and also depositing them onto carbon nanotubes. 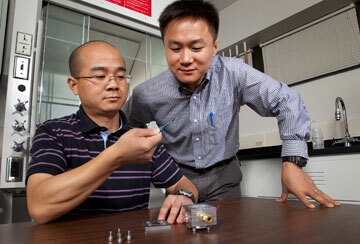 Junhong Chen, UWM associate professor of mechanical engineering (right), is commercializing his nanotechnology research. “We have found new ways of combining nanocomponents to produce valuable technologies which are superior to existing approaches,” said Chen. His methods of combining structures are not only low-cost, but also yield very high-performance materials that have potential uses in medical diagnostics, green energy technology and sensors. NanoAffix Director Ed Corrigan says the company objective is to bring practical nanosensor products to market and pursue other innovative manufacturing technology applications. The company currently is pursuing federal SBIR (Small Business Innovation Research) grants to focus on commercial development of gas sensors. This is the sixth licensing or option agreement completed by the UWM Research Foundation. The UWM Research Foundation Inc. is a nonprofit corporation that supports research and innovation at UWM through a variety of programs including patenting and licensing.